Follow US 395 to Lone Pine, then head west on Whitney Portal Road. Fresh snow graces the steep granite on the eastern face of Mount Whitney, the tallest mountain in the contiguous United States. Mount Whitney stands at just over 14,500 feet, and is visible from the eastern side of the Sierra Nevada Range from areas such as Lone Pine, the Alabama Hills, and Whitney Portal. 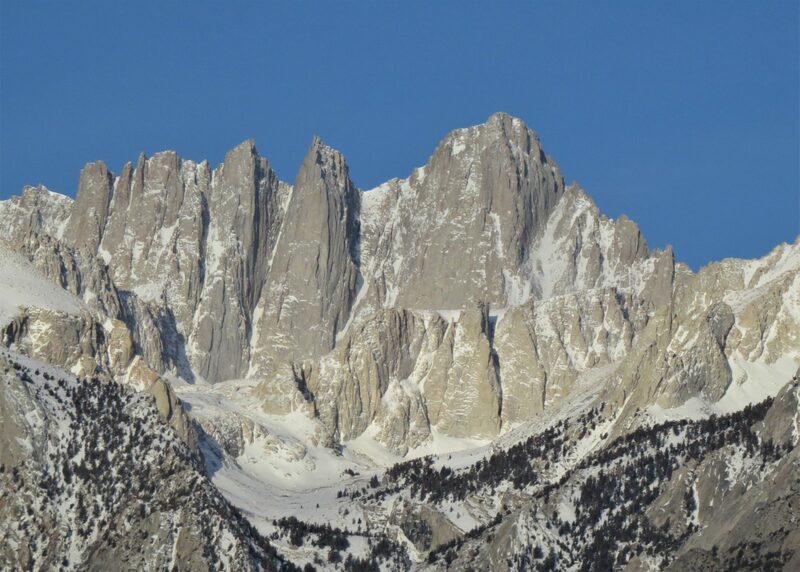 Given the steepness of the eastern face of Mount Whitney (and the meteorological 'shadow' on this side of the range), it rarely sports much snow despite its high elevation.